Designing with Blends: Conceptual Foundations of Human-Computer Interaction and Software Engineering | Free eBooks Download - EBOOKEE! Posted on 2007-07-06. By anonymous. The evolution of the concept of mind in cognitive science over the past 25 years creates new ways to think about the interaction of people and computers. New ideas about embodiment, metaphor as a fundamental cognitive process, and conceptual integration--a blending of older concepts that gives rise to new, emergent properties--have become increasingly important in software engineering (SE) and human-computer interaction (HCI). If once computing was based on algorithms, mathematical theories, and formal notations, now the use of stories, metaphors, and blends can contribute to well-informed, sensitive software design. In Designing with Blends, Manuel Imaz and David Benyon show how these new metaphors and concepts of mind allow us to discover new aspects of HCI-SE. After 60 years, digital technology has come of age, but software design has not kept pace with technological sophistication; people struggle to understand and use their computers, cameras, phones, and other devices. Imaz and Benyon argue that the dominance of digital media in our lives demands changes in HCI-SE based on advances in cognitive science. The idea of embodied cognition, they contend, can change the way we approach design by emphasizing the figurative nature of interaction. 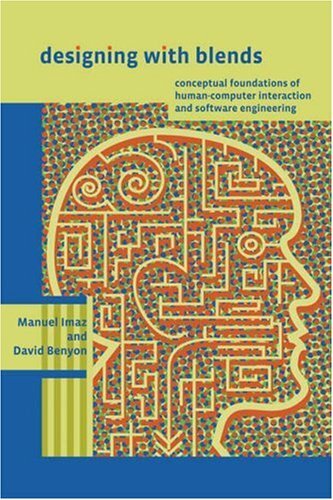 Imaz and Benyon offer both theoretical grounding and practical examples that illustrate the advantages of applying cognitive concepts to software design. A new view of cognition, they argue, will develop a cognitive literacy in software and interaction design that helps designers understand the opportunities of digital technology and provides people with a more satisfying interactive experience. No comments for "Designing with Blends: Conceptual Foundations of Human-Computer Interaction and Software Engineering".